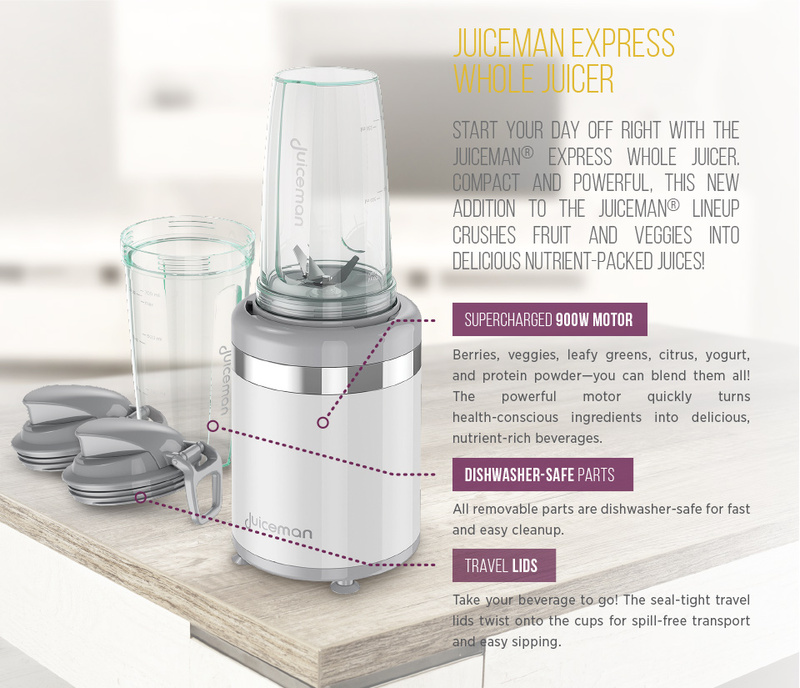 Express Whole Juicer is rated 4.9 out of 5 by 28. Rated 5 out of 5 by JJ Star from Great product I bought this product and I was so happy with my purchase I use it all the time and told my frinds about it and they love it too . Rated 5 out of 5 by MikeNYC from Helped me lose weight I received this juicer as a gift and it is honestly the best gift ever. It's very simple to use and I use it daily. I also like that this juicer doesn't take up much counter space so it's a great space saver. I have lost a lot of weight using this product. You can really enjoy all the benefits of fruits without losing nutrients. I highly recommend this juicer. Rated 5 out of 5 by Melly from Fantastic Personal Juicer This gives you all of the features of the NutriBullet but for much less money without sacrificing quality. I made smoothies and even turned cubed ice into smooth ice for sno cones. It is easy to use and the extra cup comes in handy when you are making smoothies for more than one person. Rated 5 out of 5 by Milli from Great Product My son got me the juice man I am able to make all my juices. Being a diabetic my machine is perfect it help me with my diet. 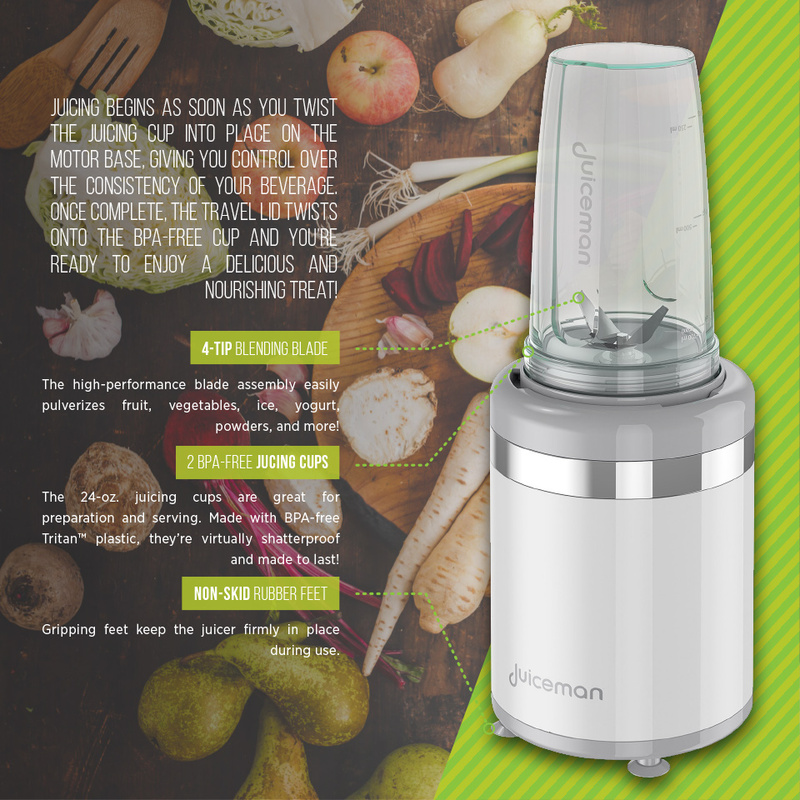 Rated 5 out of 5 by Alina E from Finally a fast and easy juicer! I love this juicer I can’t see why I would use anything else I’ve owned juicers they are so time consuming but not this one. Rated 5 out of 5 by Alyson from Amazing Juicer I recieved this item for free in return for my review. Let me say this juicer is amazing. First off it comes with 2 seperate containers to make your smoothie and they also have lids so no need to transfer if you do not want to. In total it took about 45 secs for my smoothie to be ready and it was a perfect consistency!! I will be using this for smoothies for as long as i can and clean up is a breeze no hassle rinse and go!!! I could go on and on about how much i love this juicer but my pictures are all the proof you need that if you buy this you will not be disappointed. Bonus it suctions to your counter (that is awesome) so it wont move at all. Love love love!!!! Rated 5 out of 5 by Tiffyb9784 from Love it! I am absolutely in love with this juicer! I use it all the time to make smoothies and protein shakes.It's definitely helped me get the fruits and veggies I need.It blended everything smoothly and there were no lumps or anything.It's quiet to me and doesn't have a loud motor like some other blenders I've used in the past.I like that it has a personal cup so that I can make enough just for me and not have to worry about waste.I would definitely buy another one like this in the future and would recommend it to my friends and family.